Melissa is the owner of The Hug Strap, a really cool ukulele strap that requires no strap buttons. We first met at Uke U 6 where we both had booths set up. Not only does Melissa make awesome uke straps, shes a great singer/songwriter too. When she stopped by my booth she picked up a black walnut tenor uke and played a song for a small crowd that gathered around (you can watch a short clip of her playing the same song here). Melissa ended up taking that uke home with her, but a few months later she emailed me with a new request. 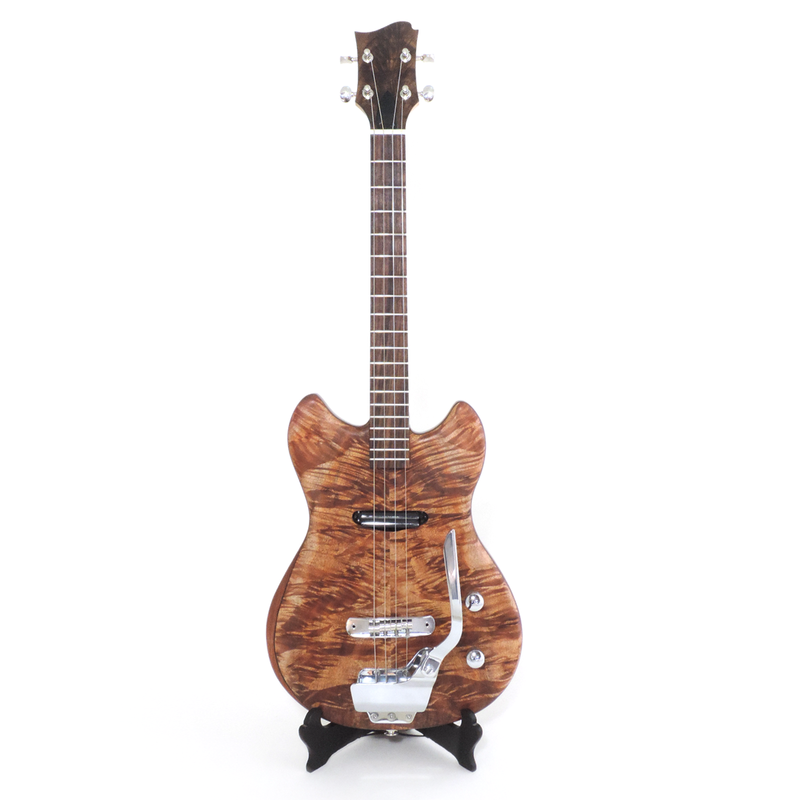 Melissa wanted a baritone ukulele with a whammy bar, also known as a tremolo. I was immediately intrigued and started to look into hardware for the task. 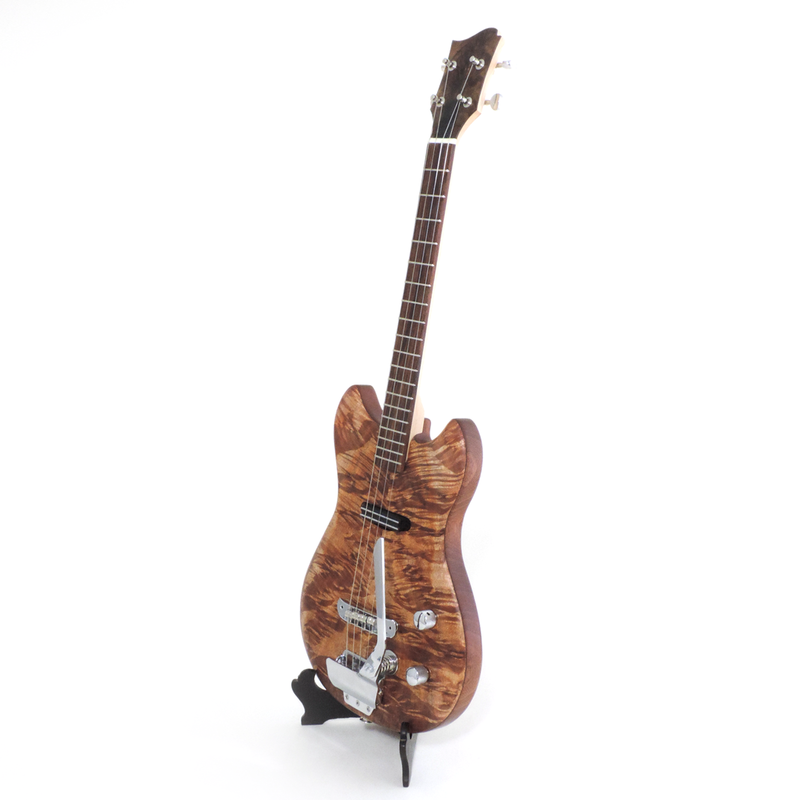 Nobody makes a tremolo system for electric ukuleles so I would have to modify guitar parts, removing 2 strings while still making it look natural on a smaller ukulele body. I found some great parts that seemed like they would fit the bill and showed Melissa some wood that I had set aside for a special project. 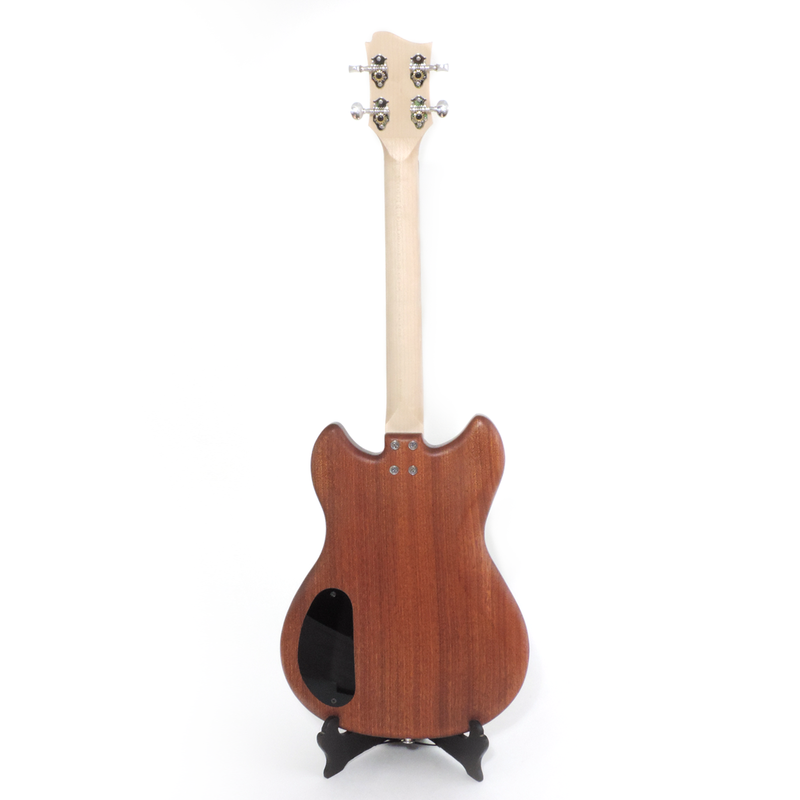 The top is the sister set of swamp koa from Tanya’s Tenor Uke and we selected African mahogany for the back with a maple neck, rosewood fingerboard and walnut and wenge accents. The engineering was certainly a fun challenge on this instrument and it was well worthwhile. This uke is a singer with lots of soul. 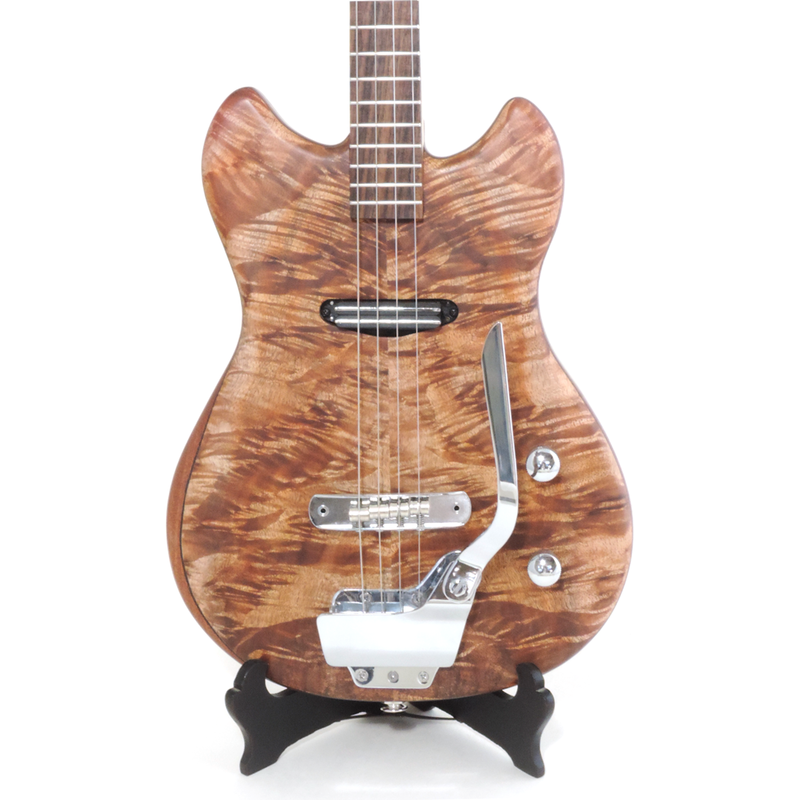 The tremolo system gives a new voice for the electric uke reminiscent of slide guitars, slack tuning and island life. I really enjoyed this build and it couldn’t have gone to a better person. *Why is that headstock different? 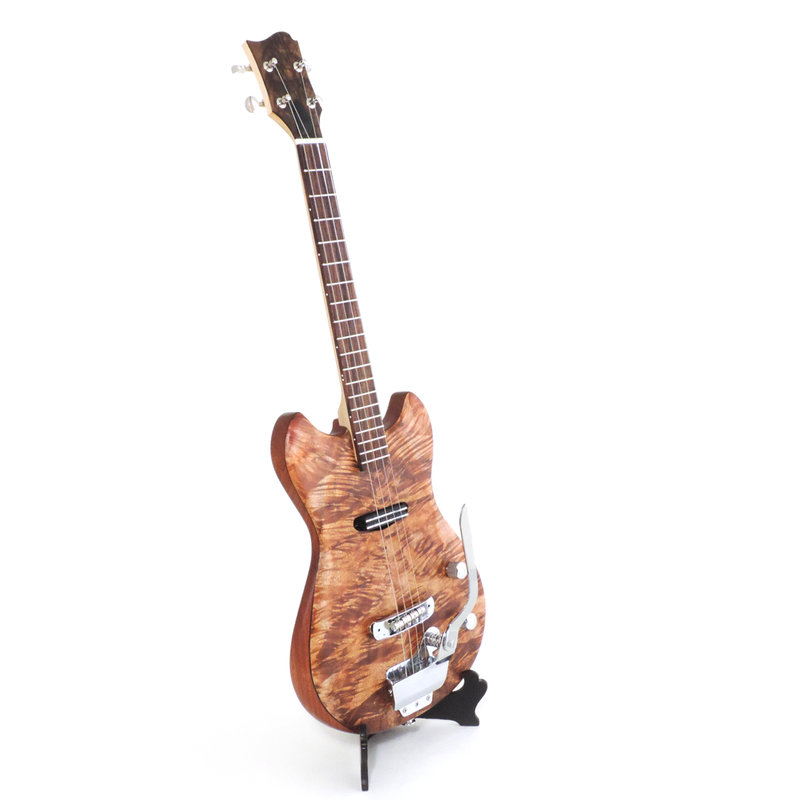 This uke was built back when our business was called Riverbend Instruments and we used a different headstock shape.